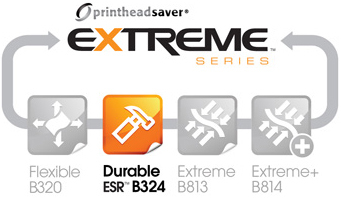 B324 Durable ESR™ is a UL approved multi-purpose resin thermal transfer ribbon designed to work with most flat head technology printers in demanding industrial conditions. B324 prints extremely dense bar codes and high-resolution images on a wide variety of both paper and film media. B324’s durable performance characteristics include its ability to withstand repeated exposure to chemicals such as isopropanol and brake fluid, making it an ideal choice for demanding applications in a wide range of high end market sectors. CLICK HERE to view the B324 Durable ESR™ data sheet.